The timeless and welcoming beauty of Biltmore provided vivid inspiration for this Christmas tree. 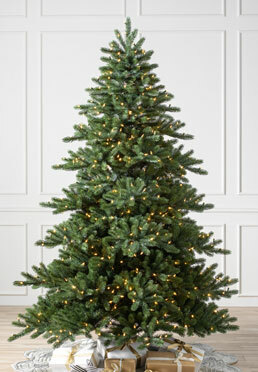 Featuring lifelike foliage, Easy Plug convenience, and hand-strung LED lights, our Biltmore Spruce reflects the exceptional care and craftsmanship that has defined the estate for generations. Our Biltmore Spruce mimics many of the beautiful details found in live evergreens. Upturned branch tips and a bright emerald green color capture the delightful charm of a natural spruce tree. Our Christmas tree is crafted from realistic True Needle foliage for an abundant look, with main branches arranged in alternating layers to form an organic silhouette.